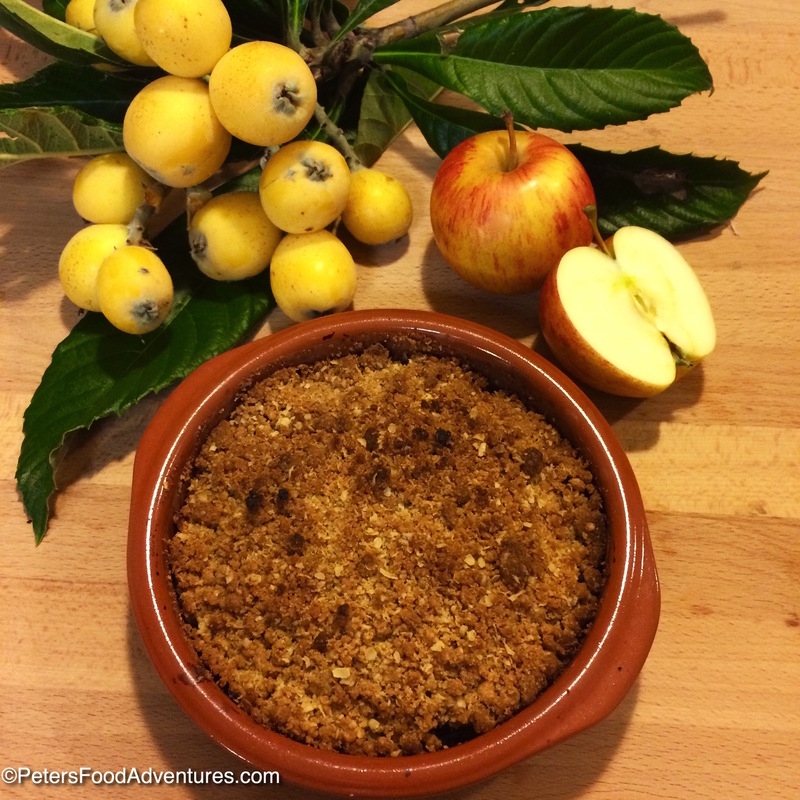 Have you ever eaten Loquat Apple Crumble? 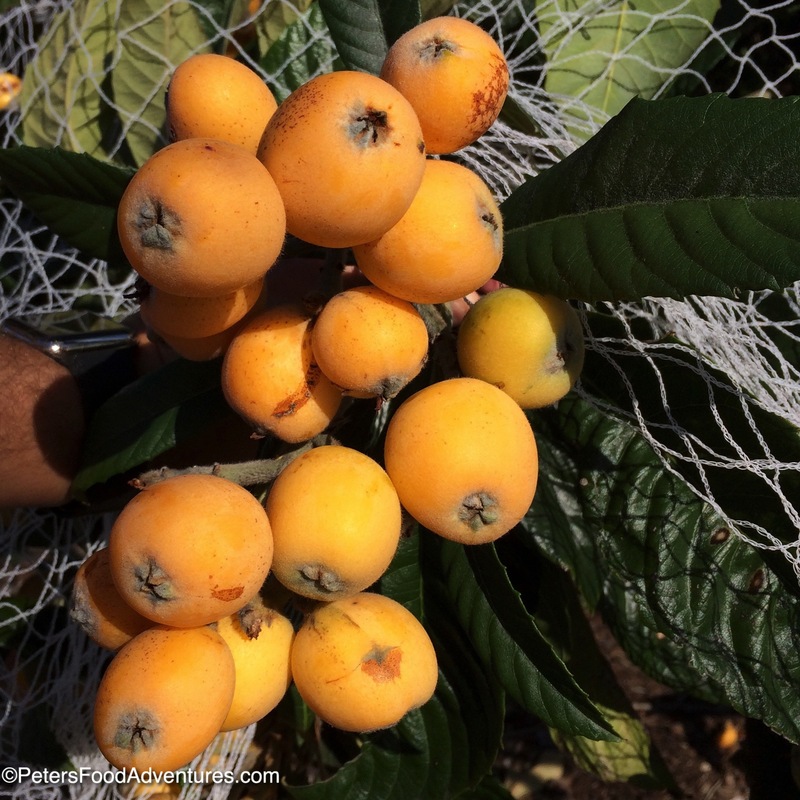 Do you know what loquats are? Loquats sometimes are called Japanese Plums or Japanese Medlars. They are closely related to apples and have a slightly poisonous seed, similar to an apricot kernel, but you’d need to eat a serious amount to get sick. Loquats have a tangy and have a sweet flavour, which I can’t really explain. They say it has the flavour of a peach, apricot, citrus and mango. You usually can’t find them at the store, because they tend to bruise easily and have a shelf life of around a week. When I first move to Australia, I discovered this fruit that ripens in late winter, when I don’t have much happening in the garden. Plus I get lots of free fruit! Have you seen the price of fruit lately? (That statement makes me feel old). I usually have so much Loquats I don’t know what to do with them. 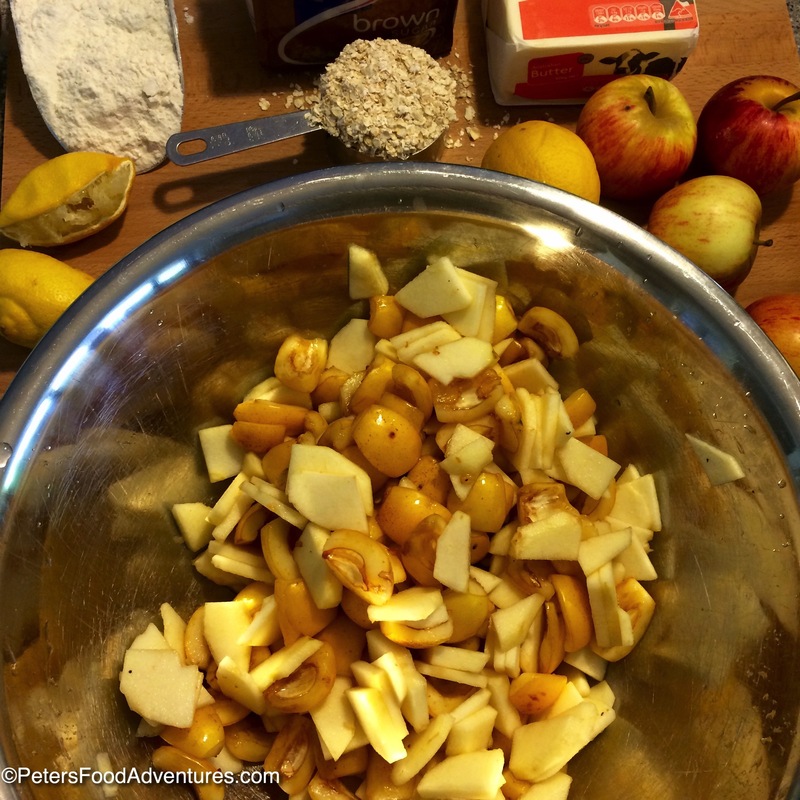 I also make a delicious Loquat Jam with Vanilla Bean that you need to check out. Jam is a great way to preserve a lot of fruit at the same time, plus everyone loves jam. Loquats seem to have fallen out of fashion as a fruit for some reason, unfortunately it’s not a cool fruit anymore. However they are really tasty, and full of vitamins such as Vitamin A, minerals and antioxidants. It’s said that loquats are incredibly healthy for your colon, and are high in fibre. You can find them in older neighbourhoods in Perth’s backyards, and are a favourite of the lorikeet parrots (I’ve covered them with a protective net). 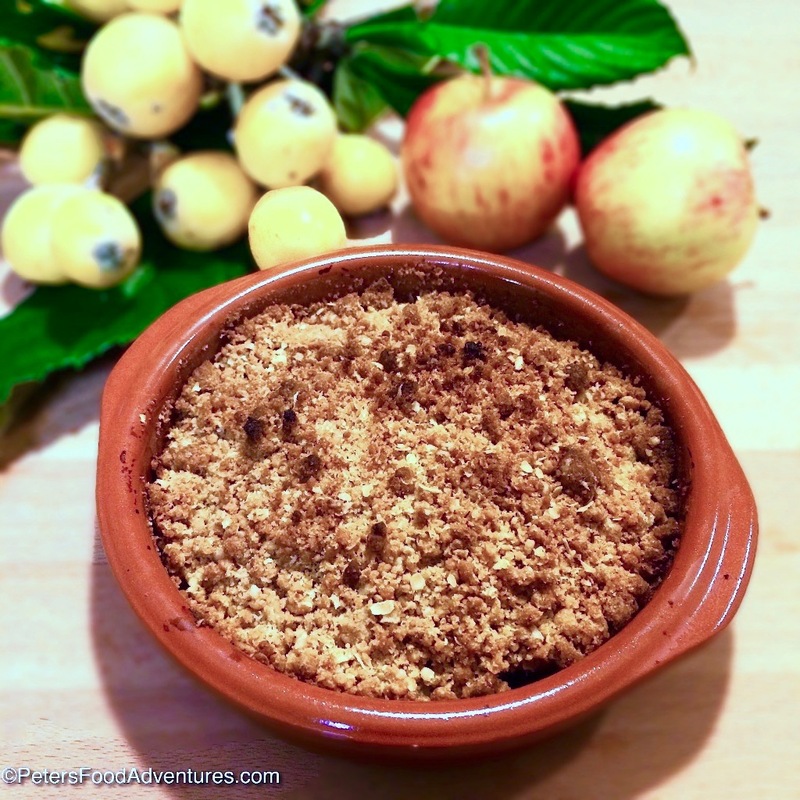 If you don’t know what to do with your abundance of loquats (which is half the problem) or your neighbour’s overhanging fruit, Loquat Apple Crumble is an easy & delicious suggestion. Bon Appetit! Приятного аппетита! Butter a 9 inch baking pan. 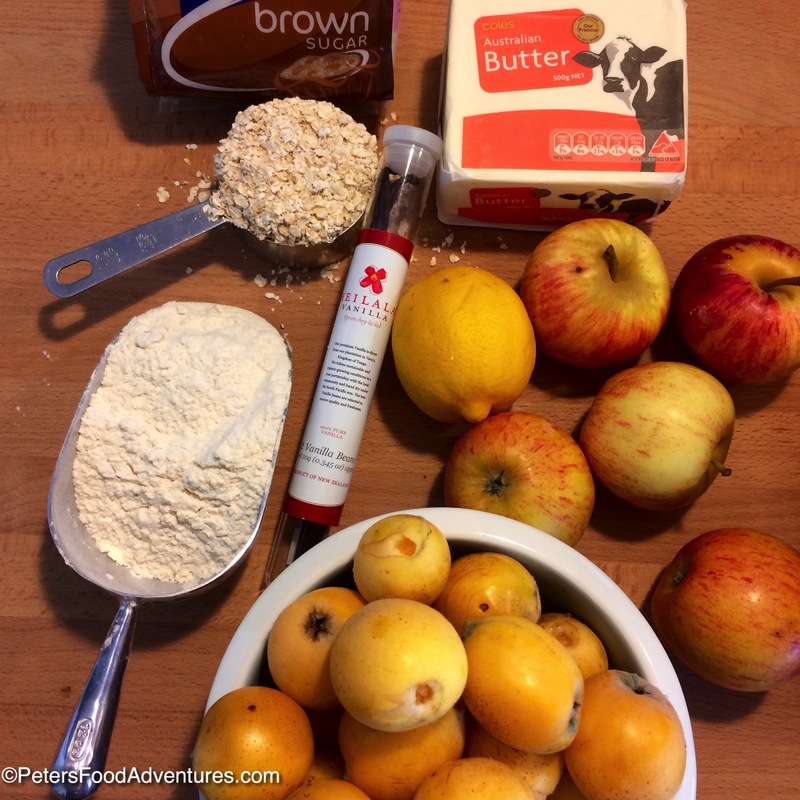 In a bowl, toss together the sliced apples, loquats and mix the vanilla and lemon juice until coated. Spread evenly across the greased baking dish. In a separate bowl, mix the dry ingredients together then cut in the butter using a fork or a pastry cutter until it forms a crumbly mixture. 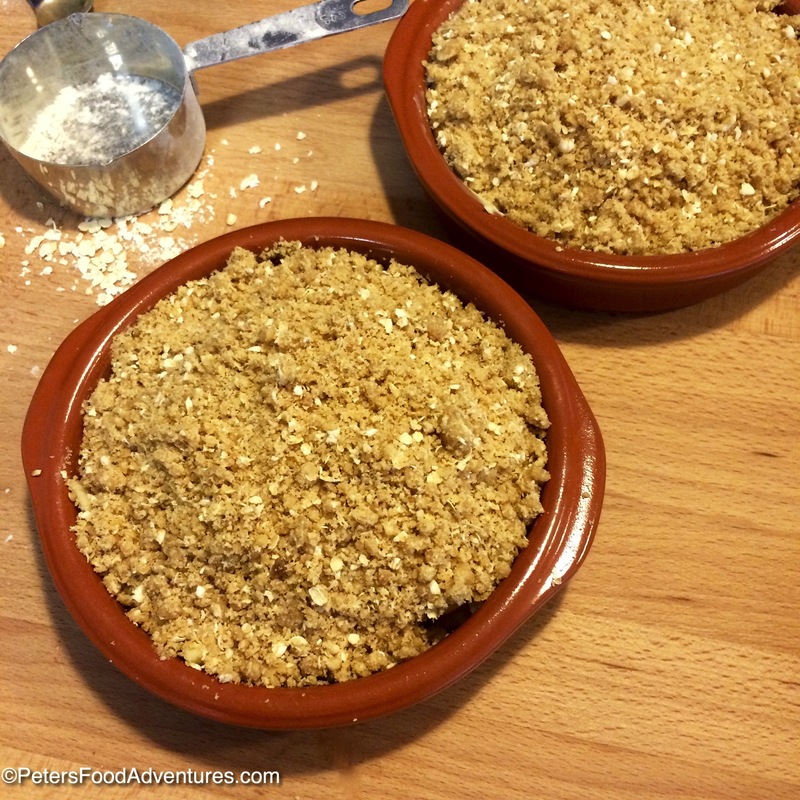 I find it’s easier to mix by hand, rubbing the ingredients with my fingers until it forms soft crumbs. 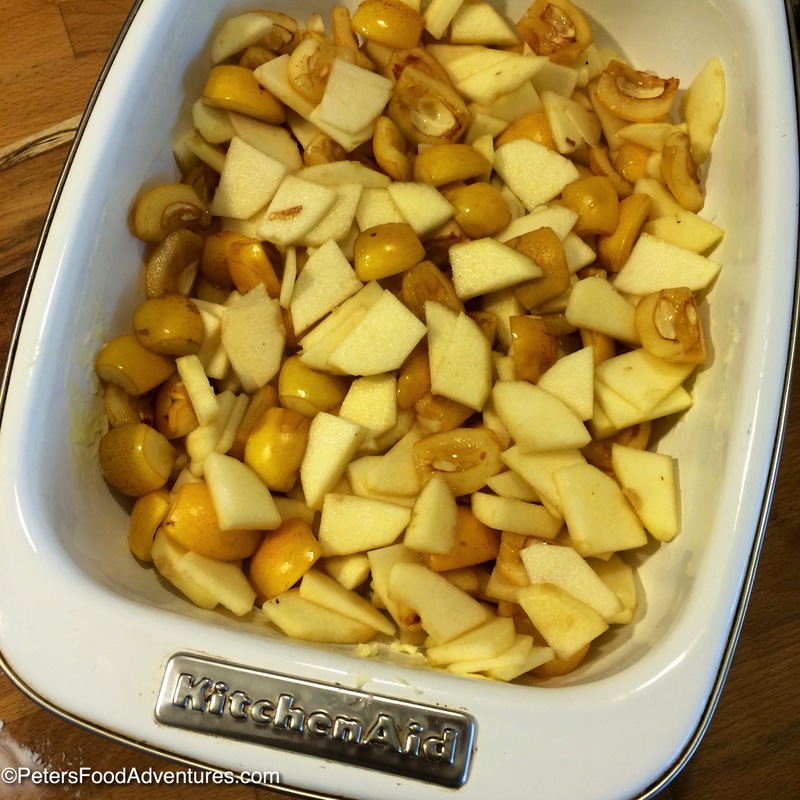 Sprinkle overtop the apple loquat mixture in the dish. Bake for about 35 minutes or until the fruit is bubbly and the topping is lightly browned. Let cool slightly before serving with vanilla ice-cream or creme fraiche. Thanks for stopping by Koko, I’m lucky to have the space and climate to have lots of different fruit trees in the yard! 🙂 Have a great weekend too! Indeed you are lucky. I long for citrus trees and since I moved to a different area…can’t grow them as well as many other types. Boohoo…oh well. I concentrate on what I can grow! Happy Fall! Oh that would be hard! I never grew up with fresh citrus trees, but would struggle not to have an endless supply of citrus year round! I’ve heard of a new lemon that has been developed that grows indoors from Canada…. that would be great if that took off! It grows on your window sill apparently! Interesting, looks & sounds wonderful! Didn’t even know the ‘poison’ pit informin Apricot, either. I could almost taste it as I read your post and the photos are awesome. God has blessed us with so many delectable fresh produce. And yes, it is great to find new ones. Thanks for your kind words! Yes, we are blessed with such abundance. Just when you think that you’ve tried all the fruits, you know, from supermarkets and cooking shows, it’s great to discover new unimaginable flavours. There’s a whole world of food that isn’t available in the supermarkets. 🙂 Heirloom veggies taste better too! Yumm this sounds so good peter! This sounds and looks delicious! I’ll never find loquats here, but I love learning about the variety of fruits around the world!